Consistent Process = Remarkable Results, Every Time. Companies do not provide exceptional results for clients again and again unless they have a process working behind the scenes to make it happen. 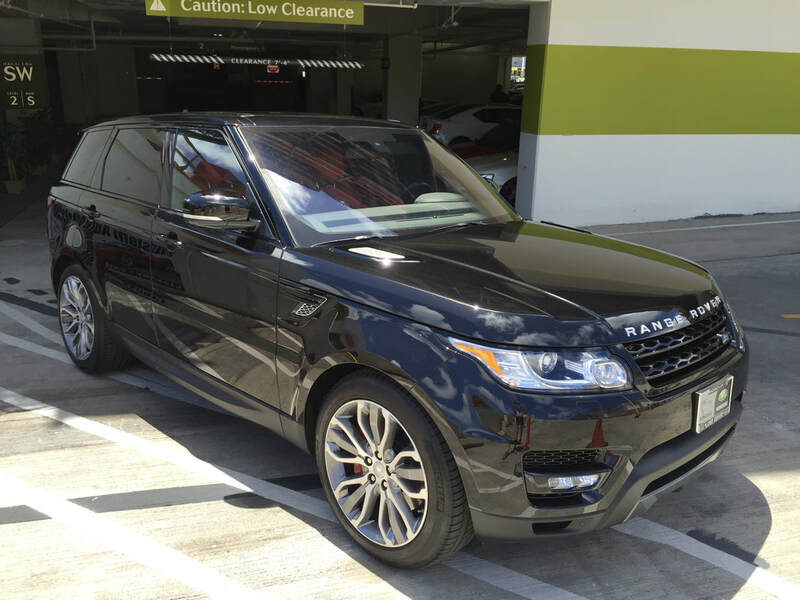 At Auto Concierge Hawaii, we are constantly relying on our own ceramic coatings process to ensure every single client has an amazing experience, from the first time they call us, to the day they pick up their vehicle. 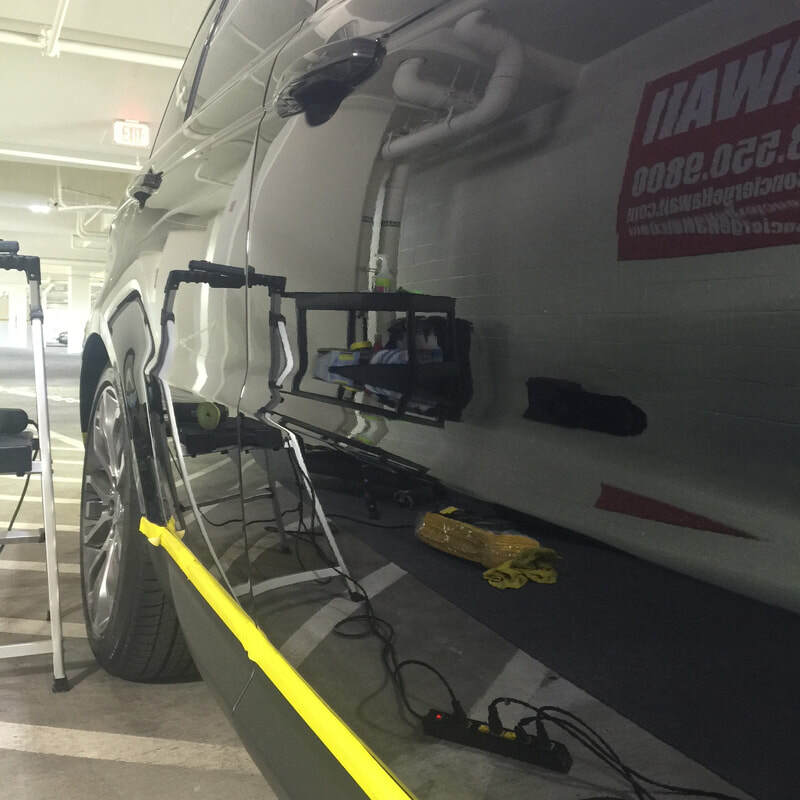 Auto Concierge Hawaii has spent countless hours perfecting our ceramic coatings process. Every one of our technicians is aware of how that process works. But we also want to make sure our clients understand how it works. This page is here to help both our current and future customers get to know our process better. And if you have any questions, we’re always just a phone call away. Consultation: We’ll discuss your goals and answer questions regarding the coating and detailing process. Inspection: Our experienced technicians perform a meticulous review of your vehicle using the most cutting-edge industry inspection tools. Book a Reservation: We’ll schedule an appointment for you to bring in your vehicle. Decontamination: We perform a full decontamination wash to remove waxes, sealants, or glazes on your paint job, and follow it up with a full clay bar scrub to remove any last embedded particles from the paint. 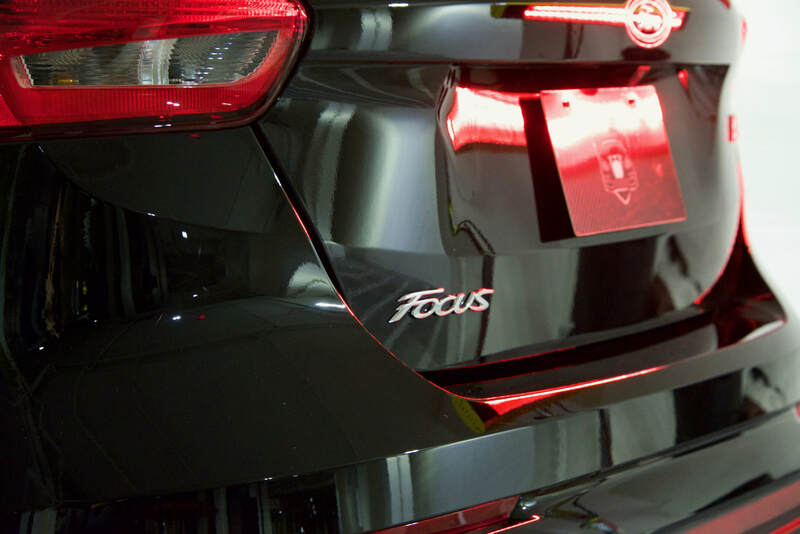 Paint Correction: We spend several hours to several days executing a meticulous vehicle polish. We’ll follow this up with a full surface degreasing to remove any oils that remain on the car. Customer Q & A: We’ll tell you the steps we took to complete your vehicle’s makeover and answer any final questions you may have about the process​.
" Auto Concierge speaks for itself! They are flawless and perfected their craft! Called Sergio to schedule a consultation to see how bad my paint was and if he was able to avoid me having to repaint my 2013 Focus ST. Met him on a Labor day Monday while he was working on two other vehicles. Sergio took the time to inspect my entire car with his special light! It was worse than he thought but was willing to put extra time into it. He explained why and how the damages were done, and educated me on how to prevent it in the future. He then did a quick demo on the driver's side fender and noticed the results instantly with just a small portion! My wifey & I had no doubts these guys knew what they were doing. We went with the 5 year plan because of our situation. Next Thursday we dropped off our hatch to Carl & another member of the team. Carl was very informative and friendly, they never mistreat you or lead you in the wrong direction. Carl said it'll take about 10hrs, which shows you that they really care about your vehicle and will take the time to PERFECT it! Not too many other professionals out there offer time like this. Ain't no half stepping with these guy's!. Got a call around 6-7 from Carl , I was unable to pick it up due to my schedule and they had no issues with me picking it up the next day. They have a private and secure spot for your vehicle in-case your unable to pick it up the day of, They don't leave it at the mall! Same night Sergio texted me and said he inspected the car and there were "a few missed water spots". This meant a lot to me and caught us off gaurd! He said he would go over the car the next morning and to pick it up after I got off of work. Me and my girl went to get our car and we were blown away! Thought it was a brand new car the results were phenomenal! Carl polished the exhaust, and their other detailer polished the windshield as well! We were blown away! Thanks to Sergio and the rest of the team it was a well worth investment! 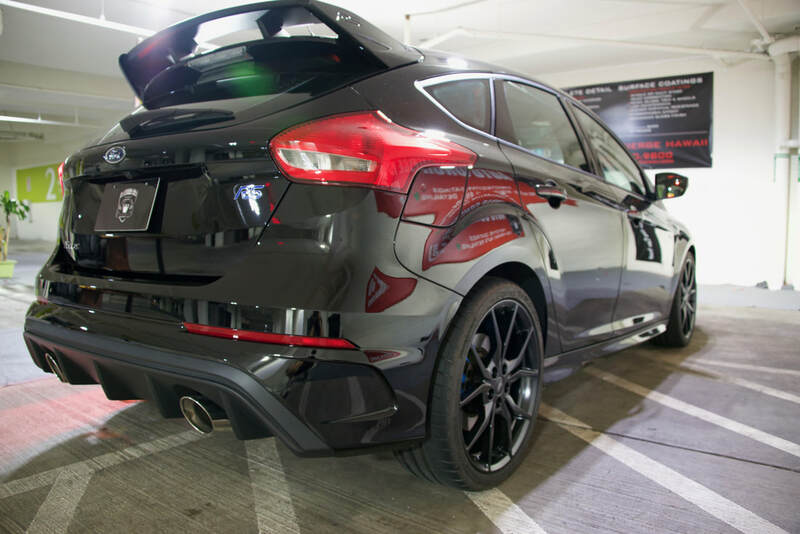 To any ST owner, or any other vehicle you may own, I guarantee you that you won't be disappointed. I highly recommend you come here if your very meticulous with your car. Thanks guy's we deeply appreciate all of the hard work and honesty! " We believe there is no better paint protection for your vehicle than ceramic coatings. And of all the brands with ceramic coating products available, it is Modesta which provides the most exceptional and highest quality products on the market today. Auto Concierge Hawaii specializes in Modesta glass coating products. Modesta’s powerful three-dimensional molecular frame coating provides a clear and durable shield around your vehicle which can last for up to ten years. Resistant to oxidation, water, acids and with great water repellency, Modesta is the premium brand we trust to deliver the results our customers are looking for. ​If you’re looking for paint protection that scores high in durability, appearance, and protection, look no further than Modesta BC-05 Advanced Water-repellant Glass Coating and BC-04 Nano-Titanium Glass Coating. Contact us today to learn more about our Modesta products. ​" I wish I can give Sergio 100 stars!! I spoke to a few of the top yelp rated detailers that work on higher end cars and wasn't very impressed with most of them. However, Sergio the owner responded within hours over email and then followed up with a call to make sure I understood the different products and services that he offered. The biggest difference with Sergio was that he was extremely knowledeable about the composition of all of the products out there in the coating world, down to the chemistry of it. I took my new car straight from the dealer to Auto Concierge for an assessment and booked an appointment the following day. He was super patient in explaining to me the different products that he offered and made his recommendations without any pressure. I dropped the car off at 8:30 AM and picked up the car at midnight. He spent 15 hours on a wash, full paint correction, polish and a coating system by Modesta called the Paul Dalton Private Label. Keep in mind, this is a brand new car from the factory so you would think it has very little paint to correct. However, Sergio is a FREAK!! He's so meticulous that he literally worked every square inch of the car to make sure the paint was clean of swirl marks and any imperfections. I stopped by his shop at the mall around 4 times during the day. He and his assitant were working on the car together from 8:30am to 6:00pm and when I went back around 7:30, he was there alone working on the coating process. After 3 coats of the Modesta products (applying this product is extremely tedious and time consuming) and cure time under the infared lights, he wrapped up the job around midnight. The results are absolutely amazing. My car has specks of metallic in the black paint which I now know radiates different colors (didn't show as well before the paint correction). Auto Concierge's prices were extremely fair for the quality of the work they do. I've been to a few detailers in town and hands down, Sergio went above and beyond my expectations (which are pretty high). To expand upon what John M. says in the other review, if Auto Concierge was a restaurant, it would definitely deserve 3 Michelin Stars (3 is the most you can get, IF your restaurant is in an area that is even rated in the Michelin guides). I would HIGHLY recommend Auto Concierge Hawaii for any car detailing work. Sergio's passion, knowledge and meticulous nature is uncomparable."